Every day we are exposed to hundreds of marketing messages. Being receptive to all of them would be mental chaos. That’s probably why 200 million people worldwide installed ad-blocking software last year. While it’s great for consumers, marketers who relied mainly on paid advertising were not that happy. Luckily there are ways to continue marketing without being blocked. 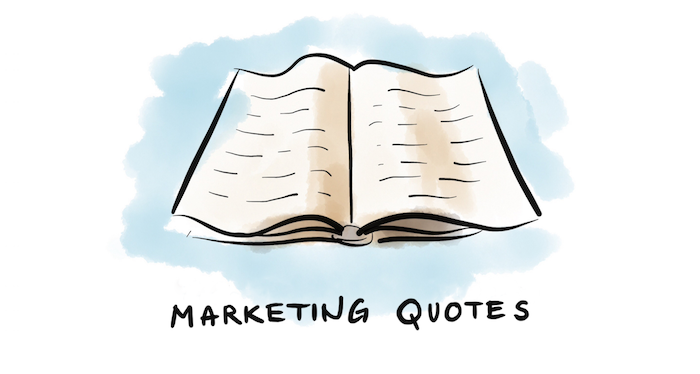 Read these marketing quotes that will put a light on what’s important for today’s consumers. Your website represents you – it’s like your business card. Since most people don’t meet the people behind a business, the website might be the only place you can show companies face. And we all know how quick people judge based on the first impression, both in real life and in the online world. People look at the website and decide whether they like to dig in or they immediately click the “x” button after a couple of seconds. Website design is one thing but it isn’t convincing without content. Make sure the content on your website is simple, clear and tells visitors what your business is about. Also, it’s super important to make the navigation user friendly. This sentence can be easily applied in marketing. Customers don’t want to hear about the features of your product or how innovative and original it is. They need information about what benefits these features provide. For example, LiveChat customers care about delivering great customer service to their clients and our product has the features to do that. But that’s just the beginning of our journey. Once our customers sign up for the trial, we have a goal to educate them in better customer service, marketing and running their business. That’s why we provide all kind of content in form of blog posts, podcasts, reports and monthly newsletters. We care about the things that are important for our customers (if you don’t have LiveChat yet, sign up for a free trial). Not everyone is your customer. The true marketing success is to reach potential customers who truly need your product and make them interested in it. The more you know about your customer, the easier it is to speak their language. If you have a travel agency and you know that your customers (a married couple) don’t like fancy hotels, but at the same time delicious food is a must, you should keep that in mind while presenting vacation offers to them. Also, if you’re aware that they have small children, you should present objects that are family friendly etc. The more information you have, the better you can tailor offers. Once you show them all the benefits, they are very likely to buy. After all, it’s what they were looking for, you’re just the person who showed it to them. You know people who go to the job interview and claim they’re good at this, this and that? That’s marketing. You have to see them in action to find out if it’s true. The same applies in business. If you want to market your business online, you can’t do without content marketing. In fact, many don’t even try avoid content marketing – it’s being used by 86% of businesses today. Content drives traffic to your website and supports building relationships with your readers. It helps you to brand your company and people will notice and remember you. It’s the reason your customers come back to your website. They read your blog, the knowledge base or case studies. Through content you have a chance to be unique and explain your product in an original way. Building trust is an important part of content marketing and a good way to do that is creating a “meet the team page.” You can also add customer stories where you share testimonials from happy customers. There are many great marketing quotes and I will keep coming to deliver them to you. In this post I wanted to show you, what visitors pay attention to and what you should focus on while doing marketing for your company. Visitors are sensitive to advertising, they want to see value in everything they pay for. There is so much business and competition today that if you don’t deliver value, someone else does and you customers will join them.